The Invacare TDX SP2 boasts unrivalled durability and ultimate performance. Great manoeuvrability indoors and out, with a wide choice of seating options for optimum comfort and support. Price excluding VAT.(Incl. VAT £6,220.80) *VAT Relief available on this product. The Invacare TDX SP2 is a powerchair that will keep going for years. It also has excellent performance with a modern style. This powerchair has been through rigorous testing. It offers maximum stability and safety. The stability lock function ensures that all six wheels stay firmly on the ground – this function works on flat or uneven surfaces. A smooth ride is further assured by the Sure Step suspension technology. As standard, the TDX SP2 is complete with a tension adjustable backrest and comfortable seat. If you’re looking for more postural support than the standard chair, any of the Invacare Modulite seating can be fitted. 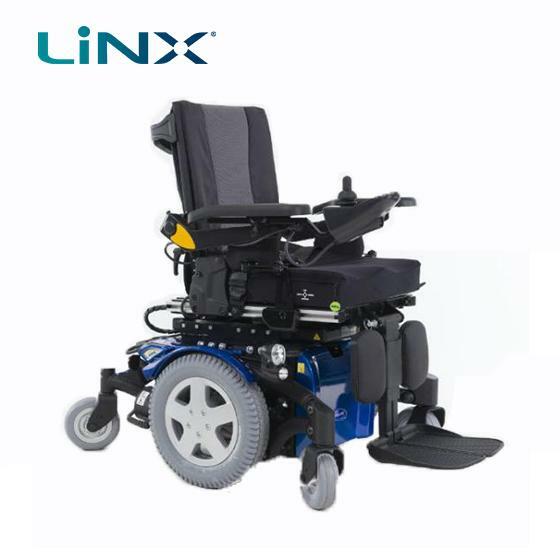 Why not take advantage of the Invacare LiNX control system that helps enhance your overall driving experience? It also enables maintenance updates to be sent wirelessly, plus it gives professionals quick access to statistical and diagnostic information. As you’d expect on a high-end powerchair, features such as powered lift, tilt, recline and powered elevating leg rests. Due to the modular design, these extra features can be added at a later date. The TDX SP2 can be personalised to your preferred style including a choice of 10 shroud colours and 10 colour inserts for the wheels. If you’re looking for a powerchair superior safety, stability, and a sleek design – then the TDX SP2 is for you. If you’d like any further information on the Invacare TDX SP2 or any of our powerchair range, please give us a call on 02392 255600. We’d be more than happy to help.